I thought i start of the new year to learn how Git works and publish my first project on Github for easier version control and sharing capabilities. This project is my take on Two-Tier PKI environment using Active Directory Certificate Services (ADCS). The configuration is pretty simple. It consist of two servers, virtual or physical doesn’t matter. 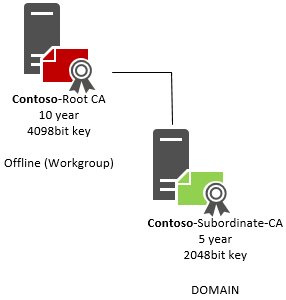 One is used for Root/Offline Certification Authority (CA) and the other one is for Enterprise/Subordinate CA. The installation procedure and scripts is available on the Github repository.